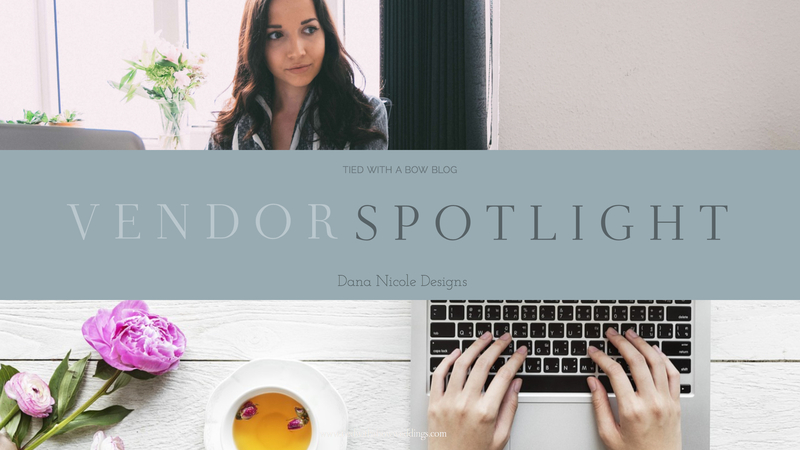 Today in the Tied With a Bow Weddings Vendor Spotlight, I spoke with Dana Fiddler of Dana Nicole Designs. Dana and I met through work in Calgary and followed similar paths as fellow hockey wives. Living overseas during the hockey season prompted Dana to create a job she could do from anywhere in the world. Her design work helps creative entrepreneurs brand their companies, but also brides & grooms create gorgeous wedding websites! Today, Dana explains the benefits of wedding websites in the planning process and how a pro could help you! What are the benefits of having a wedding website? Wedding planning can get hectic! Tied With A Bow Weddings and Dana Nicole Designs have partnered to help make your planning journey as smooth as possible. Having a wedding website ensures that all your guests will be receiving the same information and it will all be easily accessible in one place! You will be busy trying to plan your seating charts and choosing the perfect menu. But! Having that beautiful website where your guests can go to get their questions answered will allow you to focus on the little details of planning your big day. What information should be on a wedding website? We will work together to build a website that fits the color palette, look and feel of your wedding. Your wedding website is an indepth extension of your wedding invitations and lets your guests know exactly what will happen on the day of your wedding (and leading up to if you are having an out of town event). And of course, your website will also tell your love story and showcase your relationship with your fiancé! What is the benefit of hiring a professional to create your wedding website? When you are busy trying to find the perfect dress with your loved ones, the last thing you want to be worrying about is how you are going to build your website. Leave the technical stuff up to me while you focus on ensuring your day is everything you’ve dreamed of! Having a professional design your website will ensure it fits with the aesthetic of your wedding and will work properly on all devices (desktop, mobile, tablet) ensuring that your guests will all have the same experience no matter what device the visit your site on. Learn more about Dana Nicole Designs here + get social by following her Instagram, Facebook, Twitter + Pinterest!